I know I don't normally do a post on the weekends, but for those of you that might be interested Kathy Shaw has opened registrations for her ICQC101 (Designed & Piecing CQ Blocks) and you'll have to hurry if you want to register because it's only open until tomorrow. Go HERE if you want more information. Edited to add (thank you Judy!) that you must have completed Kathy's beginner's crazy quilt class in order to register for this one. First of all, thank you all for expressing your concern and prayers for our building superintendent who was shot in that incident last night. The latest information we have is that he was airlifted to Toronto (our nearest big city) and is in stable condition. The shooter is still at large, but police divers have recovered the gun from the river that runs past our buildings. There was a very large police presence around our buildings for much of the day. Apparently our super got into an altercation with a moron who was walking around with open beer - against the law - which culminated in him being shot twice at close range. We live in a smallish town and I know we have our fair share of morons here, but these sorts of things are quite rare and certainly not in broad daylight in an area that is primarily retirees. Certainly rocks the world you think is safe! The seam to the left is simply a piece of flowered trim with some little ball trim on each side for additional interest. The seam to the right is done with pearl cotton. The cat (a brooch) was discovered on our last thrifting expedition and is absolutely perfect for this project. The recipient has a cat we jokingly call 'The Cat From H-E-Double-Hockey-Sticks' and doesn't this one look the part? He's not stitched down as yet and will end up having beads for eyes. I'm working on another section, but will save that to show you later. 1. Renee has been working on an Under The Sea crazy quilt block and has posted a series on her blog about the steps she took to create it. You can go HERE to see the completed block and then follow her links back to see it evolve. 2. Kathy Shaw has posted a couple of great tutorials that you might find interesting as well. The first is a stumpwork acorn and oak leaves and can be found HERE. The other is showing some really cute owls she has created and can be found HERE. Today the quote is from the Dalai Lama..... "We live very close together. So, our prime purpose in this life is to help others. And if you can't help them, at least don't hurt them"
The coins on the upper seam treatment are held down with beads that are quite reminiscent of jade. Below that is a narrow seam treatment done using my favourite waste canvas. To the right of the tree the seam was done with the aid of the wonderful stencils by SharonB. We just had a scary incident in front of our buildings - one of our building superintendents was shot. There's a massive police presence outside and we have been told to stay inside (which we are very happily doing). Our super is alive, but has been shot twice. I guess our safe little town, really isn't all that safe after all. Of course we know that it's an isolated incident, but it rather shakes your faith in how safe your neighbourhood really is. Today's quote is from J.M. Barrie.... "Shall we make a new rule of life from tonight: always to try to be a little kinder than is necessary"
If you live anywhere in the Lindsay (Ontario, Canada!) area, you might want to check the show out. If it's anything like previous ones, it will be a good one. For those of you who are interested in doll making, Adele Sciortino has an interesting site with online classes on offer, as well as a wealth of dollmaking information. Go HERE. And, for those who are interested in creating with paper - have a look at what The Toymaker has on her site. There are LOTS of free patterns and ideas HERE. Today your quote is from Leo Buscaglia.... "Life is a paradise for those who love many things with a passion"
Isn't he just the cutest teapot ever? I have absolutely NO need for another teapot (technically this little fellow wouldn't work well as a real teapot anyway....his little hat comes off and it's nigh onto impossible to stuff a teabag into the tiny little hole, much less get it out again once it's wet and has expanded). No matter, he makes me laugh every time I look at him, so he had to come home with us. Some of you know I have an ongoing quest to find interesting books about embroidery for my collection and this little beauty jumped into my cart too. It's a wonderful reference book and also has a number of patterns inside, one or two of which I already plan to utilize on my latest hussif. As I mentioned last time, I wasn't happy with my first tree effort on the hussif, so it's subsequently been replaced. Not that this one is a whole lot better, but in real life it shows up better than in the photo. The tree is worked with straight stitches and the trunk is chain. The seam to the left is a wrapped back stitch and there are lazy daisy stitches surrounding the rice pearl beads. Today's quote is from an anonymous source... "Don't look where you fall, but where you slipped"
I spent a couple of hours stitching a tree, and then promptly reverse stitched it. I use tissue paper to create patterns and stitch over top of it. I thought the colours I had chosen for the tree would be okay, but once the tissue was removed the tree faded into the background too much. I should have remembered to take a picture before I ripped it all out and shown you a 'how-not-to' post. Oh well, tomorrow I will re-stitch it and hope it looks MUCH better!! For those of you who like to quilt, Vicki Welsh has a list of free quilt patterns that you can see HERE. There is LOTS of inspiration! 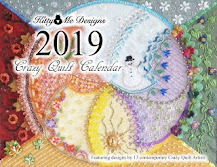 Today the quote is from anonymous.... "When nothing goes right, go left"
Pam Kellogg has asked that I let you know that she is searching for people interested in placing Community Ads in the next 'Crazy Quilt Quarterly' magazine. If you have a blog, Etsy shop, or crazy quilting supplies for sale please contact her at pkellogg AT mc DOT net. You can also find out more HERE. It's a great way to get exposure for your business or your blog! I'm a huge fan of the gorgeous felted pieces that Jackie Cardy creates (and am lucky enough to own a couple of her creations) and she has just opened her own web site HERE. Go and have a look at the pieces in her gallery. Gorgeous!! She also blogs HERE. Kathy Shaw has just announced that registration is now open for her ICQC102 (Paints, Dyes, Inks, Markers) module which covers such topics as painting fabric backgrounds and dyeing lace motifs. Registration is only open May 19 through 22nd so you'll have to hurry! Go HERE for further info. As always, Kathy's classes are free. Today your quote is from Winston Churchill ... "It is a mistake to try to look too far ahead. The chain of destiny can only be grasped one link at a time." Some sections of this hussif won't be embroidered because the pattern in the fabric is already perfect, as you can see here. All I've added is a simple cross stitch seam treatment at the bottom, some whipped buttonhole stitch on the upper right, along with the recipients name (another use for waste canvas!). I don't think she reads my blog, so it's safe. 1. A great source for vintage transfers can be found HERE. Be sure to scroll through her blog to see all the lovely patterns. 2. There's another one HERE. You have to become a member (free), but it is definitely worthwhile. There are hundreds of patterns!! 3. And for general embroidery and needlework goodness, it's always worth checking out the Antique Pattern Library HERE. There are links on the page to take you to all sorts of resources for different forms of embroidery. Today the quote is from Terri Guillemets...."With arms outstretched, I thank. With heart beating gratefully, I love. With body in health, I jump for joy. With spirit full, I live"
I did a trapunto treatment on the fan, added a waste canvas cross-stitched 'ox' and added the beaded tree beside the dragon. I hope that the tree somewhat resembles cherry blossoms - at least that was the intent anyway!! For those that are interested, the tree 'trunk' is simple whipped back stitch with pearl cotton and the leaves are lazy daisy stitches surrounding cast-on stitch, also done with pearl cotton. The 'ox' is because the recipient of this hussif was born in 'The Year of the Ox'. .... "To laugh often and much, to win the respect of intelligent people and the affection of children; to earn the appreciation of honest critics and endure the betrayal of false friends; to appreciate beauty; to find the best in others; to leave the world a bit better, whether by a healthy child, a garden patch or a redeemed social condition; to know even one life has breathed easier because you have lived. This is to have succeeded"
Well, just one dragon, but that's okay. I put this little guy on the Oriental hussif I'm working on. Today I have a couple of things that some of you might find interesting. Firstly Cathy Shaw has announced open registrations for her free intermediate ICQC-103 class "Embroidery With Threads". You must have taken her Beginner's class, as well as ICQC-101 in order to sign up for her latest offering. Go HERE for further information and be sure to register before midnight on May 15th. For those of you who are interested in sane quilting there are tons of links to free patterns to be found HERE. There's some really nice ones so it's definitely worth a look. Today the quote is from Beverly Sills... "You may be disappointed if you fail, but you are doomed if you don't try"
(for some reason, Bloggrrrrr is having a hissy fit and won't let me set up this post properly! So - sorry - but it looks like you will have to get your quote of the day at the beginning, rather than the end). Today's quote is from Elizabeth Stone.... "Making the decision to have a child is momentous. It is to decide forever to have your heart go walking around outside your body". Look what arrived this morning, courtesy of #2 son and daughter-in-love! I'm definitely a lucky mom!! #1 son and daughter-in-love had planned to take both mothers to a lovely big greenhouse tomorrow, but we've had to decline. Neither DH or I feel our allergies can cope with an influx of scented flowers and plants at the moment. It would have been such a lovely outing though. Hopefully once the allergies straighten up and fly right, we can re-schedule our trip. Food? Did somebody mention food??? Preheat oven to 350 degrees and grease 3 loaf pans. In mixer bowl combine oil & sugar; add eggs and vanilla & mix. Combine bananas & coconut milk. Alternately mix dry ingredients & banana mixture into oil mixture. Fold in coconut. Evenly divide between 3 loaf pans. center comes out clean). Cool completely in pans. Oh, you wanted a picture too? 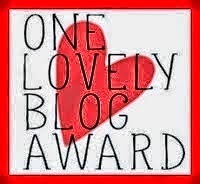 First of all, I must thank my blogging friend Christine from 'Patchwork Allsorts' for nominating me for the 'One Lovely Blog Award'. - Thank the person who nominated you and link back to them in your post. - Share seven facts about yourself. - Nominate 10 other bloggers for the award. 1. I've been married to Jack for nearly 36 years and we have two sons (32 and 30) and two amazing daughters-in-love and now one incredible grandson. 2. I was a stay-at-home mom and prior to that I worked in banking for a number of years, as well as being a secretary in a high school before that. 3. We are now retired and live in an apartment building that overlooks our local river. There's a walking path just outside our building that follows the river to the downtown core (and our favourite coffee shop). 4. I was raised on a farm and my playmates were dogs, cats, cattle, pigs and a horse. 5. I'm an only child and married a man who has 8 siblings. Talk about culture shock! 6. I first started into crafting when my aunt came for her yearly visit (I was about 12 I think). She was crocheting one of those huge single-Granny square afghans and showed me the basic stitches. I progressed from there into many other forms of craft and am pretty much self-taught. The advent of the internet opened up a whole realm of possibilities (and interests) in crafting and that's how I learned. 7. I am a crazy quilter (but you all know that, don't you). Now, according to the rules, I'm supposed to nominate 10 bloggers for this award. Instead, I'm going to nominate ALL of you!!! All of my readers are such wonderful people and have such interesting (and fun!) blogs, so how can I pick just ten? So....I'm throwing down the gauntlet....if you want to play along (or are even just looking for something to write about on your blog), consider yourself nominated!!!! 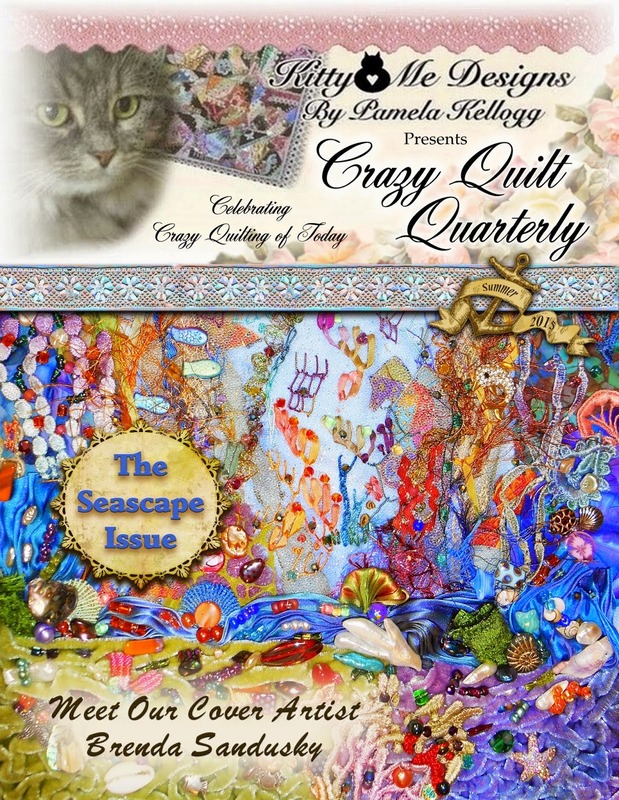 Many of you know that I'm involved in the new 'Crazy Quilt Quarterly' magazine spearheaded by Pam Kellogg, and will have noticed the cover pictures in my sidebar (where, by the way, you can click and be taken directly to where you can purchase your very own copy!). I'm asking you a favour - would you please consider doing a little blurb on your blog about the magazine? Our success depends on two things - people submitting pictures and/or articles about their work AND the word getting out that the magazine even exists. The more people that post about it, the more the word will get around, and the magazine will just keep getting better and better. If you want further information, please feel free to contact either Pam (pkellogg AT mc DOT net) or myself (marmic1954 AT hotmail DOT com). Thanks so much!! I would like to give you a heads up about a Canadian online fabric source that I have recently discovered (and must say am impressed with their service!!). Check them out HERE. The owner is willing to go above and beyond, and my fabric arrived much sooner than expected. Finally, because I know there should be a picture to 'reward' you for all this reading you've been doing, here's the block I just completed with Kathy Shaw's online Beginner's Crazy Quilt Class. I definitely can recommend her classes to anyone considering trying crazy quilting and even those of us who are versed in the art. Alas, her latest Basic Beginner's class registration has closed, but I will be sure to notify when the next one is available. (According to her website the next Basic class registration will open June 27-29). Today your quote is from Tallulah Bankhead...."If I had to live my life again, I'd make the same mistakes, only sooner"
As far as red noses go, I think Rudolph still has me beat, but that's not to say I'm not trying to run a close second! Be gone, allergies - get thee behind me so I can go outside and not be kept inside like a hothouse plant! Needless to say there's nothing creative happening around Chez Magpie, so instead I'll send you over to have a visit with Karen Ruane and read all about her latest online class that's just gone on offer. If you've ever contemplated joining in on the fun, now is the time and I can tell you, from experience, that her classes are great fun. Not only will you get to watch Karen create her amazing embroideries but you will also get to play along (and get to know) some really nice people. Go on, join in the fun (you know you want to!!). Go HERE. 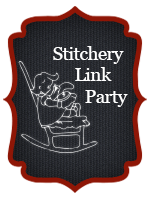 Today I am joining in with the Monday Stitchery Linkie Party being organized by SuperMomNoCape HERE. Today the quote is from Florida Scott-Maxwell...."I want to tell people approaching and perhaps fearing age that it is a time of discovery. If they say "Of What?" I can only answer "We must find out for ourselves, otherwise it won't be discovery"
1. Mary Corbet has released her 'Stitch Sampler Alphabet' book and it's a beauty! If you are interested in monograms and/or alphabets in stitch go HERE. 2. 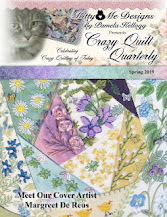 Kathy Shaw in now taking registrations for another of her FREE crazy quilt beginner's classes and you can find out about that HERE. You'll have to hurry though because registration is only open until May 4th. I can happily attest that Kathys classes are great! Today the quote is from Charles Schulz...."Life is like a ten-speed bike. Most of us have gears we never use"